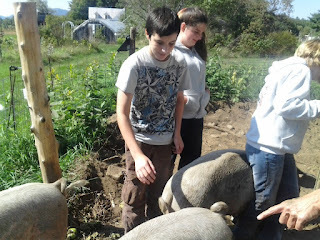 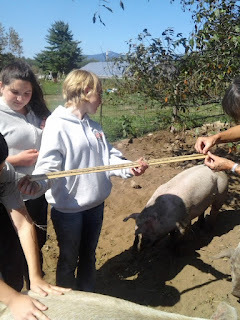 About 2 of weeks ago, the science class came out to measure the porkers. The top two (Mason and Bartholomew) measured at about 200lbs, the niddle two (Robin and Pursey) at about 175 and little Tar weighed in at 140. They are planning come back out next week to get another measurement... then they can compare the two and track growth, plus get a closer estimate of market weight.